- S :- Length - 45in, Waist - 34in, Chest - 38in, Shoulder - 14in, Sleeves - 18in. -M :- Length - 45in, Waist - 38in, Chest - 42in, Shoulder - 15in, Sleeves - 18in. -L :- Length - 46in, Waist - 40in, Chest - 44in, Shoulder - 16in, Sleeves - 18in. -XL :- Length - 46in, Waist - 42in, Chest - 46in, Shoulder - 16.5in, Sleeves - 18in. -Note: The measurements given above are garment measurements. -This kurta has been crafted from hand-woven chanderi and decorated with hand-block prints carried out by artisans in Sanganer, Rajasthan. 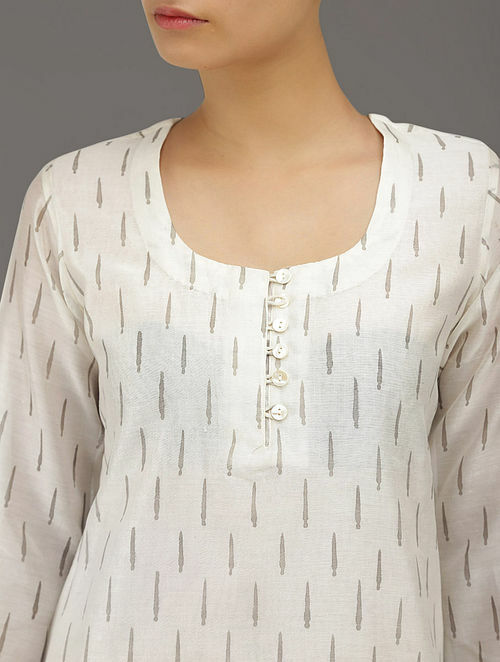 -Amalgamation of tonal printing, non-cluttered designs and subdued colours make this kurta distinctively subtle and elegant.